The claustrophobia and lurking fears engendered by the ghoul warrens are now starting to get the characters (and the players themselves) well and truly anxious to complete this mission. The lingering idea that Daria (the Bard) might be right about the invasive interpretation of their mission was obviously playing on some people’s minds – with the question being asked: “are we the bad guys here?” To that end, when Daria asked that no one smash the next shrine encountered in the tunnels so that she could examine it, there were no arguments. Unfortunately, the next shrine encountered was actually a mimic that was living in a symbiotic partnership with the local ghouls. When Daria began to poke and prod at it, it struck back, tangling and capturing her in its sticky pseudopods. In the narrow tunnel, the party’s efforts to rescue her were hampered by opportunistic attacks by more ghouls and threat of their weapons getting stuck to the mimic’s glue. Ruin ended up, in his raptor form, glued by each limb and his mouth to the creature. 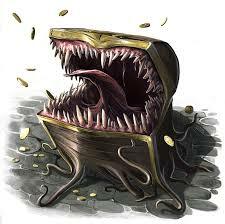 Bumperklart hit on the idea of intimidating the mimic, expressing a desire to retrain it as a pack creature along the lines of mobile luggage, but the rest of the group persisted on carving the creature up as they didn’t trust it to not turn on them. Another nearby shrine was soon discovered, and there seemed to be no good or wholesome symbolism involved in their design. Strangely reassured by this discovery, the group continued further into the maze. Their doubts were banished. Then everything went quiet. Everything happened at once, shortly after that. The drumming and chanting had been part of a dark ritual taking place in the ghoul’s main nest, and now the fruits of that ritual were sent against them. The wheep stepped back out of the shadows and shook their reserve with its cries, and just as everyone focused on it, a skeletally thin demonic creature dripping with acidic slime teleported near the back of them, intent on attacking the bard and Spugnoir directly. Madrigal moved to intercept it, and found the creature was a formidable opponent, more than capable of standing toe to toe with him. Worse, the slime coating its limbs succeeded in destroying one of his prized magical blades. In an attempt to stave off the Wheep, Ruin began to cast a summoning spell only to find a third opponent stepping out of an unnoticed tunnel entrance – the gravetouched ghoul monk who led the colony. Ruin weathered the flurry of vile blows that rained on him and managed to maintain his concentration long enough to summon a unicorn within the narrow confines of the tunnel. This potent creature of good made short work of the wheep, delivering healing magics through its horn that disrupted the dark magics powering the creature. The ghoul monk fell shortly after, and with that the Babau Demon teleported away. The sudden silence and calm left the group wary and wondering how to proceed.